Spells cost 3% less to cast. The Saarthal Amulet is an amulet found in its eponymous location. 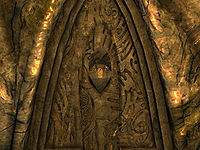 In appearance, this amulet is identical to an ancient Nord amulet, though it weighs slightly less. It reduces the magicka cost of all spells by 3%. When you enter the ruins during Under Saarthal, Tolfdir will assign you to help Arniel Gane search for artifacts. When you reach Gane, he will say "Ah, yes. You. I remember you. You're going to help? That's fine. Just... Just don't make a mess of my work. I've only looked through a portion of this section. You, uh, you can look around in the chambers just north of here. Try and be careful, all right? We don't want to damage anything." This will add a quest marker for this amulet, which will initially be labeled Ancient Amulet. When you pick it up, a spear trap will trigger, trapping you in the chamber. If you equip the amulet, it will trigger a visible resonance effect with the wall where it was found. Casting any targeted spell or shout at the wall with the amulet equipped will shatter the wall and disarm the trap, allowing you to proceed with the quest. This is the only item in the game with the fortify spells enchantment. The enchantments on the Archmage's Robes and Diadem of the Savant are functionally identical, but use a different enchantment that fortifies all schools separately. Only the Fortify Spells enchantment appears in the amulet's description. The first enchantment effect, named Fortify Spells, only technically affects Alteration spells, hence the other enchantment effects. 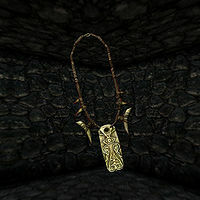 The Saarthal Amulet lacks the ClothingNecklace keyword. This bug is fixed by version 1.27 of the Unofficial Skyrim Patch.